The following are examples of electives one might take for the certificate program.  In addition to courses in the College of Arts and Sciences, students may take eligible courses in the College of Commerce, the College of Communication and Information Sciences, the College of Education, and the College of Human Environmental Science. Please contact Dr. John Friel, Museum Studies Advisor, at jpfriel@ua.edu for an official list of approved electives. An exploration of the formative years of the American cultural experience, from early European encounters with the New World to the attainment of continental nationhood. The course will draw upon insights from many disciplines and will include several kinds of cultural evidence (for example, literature, art, and photography; religious, political, and social thought and behavior; and economic, technological, and geographical development) as well as consideration of recent major synthetic works of cultural scholarship. Topics covered include the growth of colonial societies; the Revolutionary movement and the political foundations of the American Republic; the Market Revolution and the rise of middle-class culture; the antebellum South and the emerging West; and the origins and evolution of American cultural diversity. An exploration of the development of the American cultural experience since 1865, focusing on the major material forces and intellectual currents that helped shape American attitudes, assumptions, institutions, behavior, and values. The course will draw upon insights from many disciplines and will include several kinds of cultural evidence (for example, literature, art, and photography; religious, political, and social thought and behavior; and economic, technological, and geographical development) as well as consideration of recent major synthetic works of cultural scholarship. Topics addressed, and readings assigned are chosen to enlarge awareness of the transformation of America to a diverse, metropolitan, industrial society. These will include the relationship between nature and the city; the industrial revolution and changes in the workplace; immigration; changing class and gender relationships; the rise of leisure; and the development and triumph of modern corporate/consumer culture. This field course focuses on the large array of grave markers that are found in burial grounds. In effect, these are museums of the dead, as they say as much about the living as they do the deceased. This is a fine elective for someone interested in anthropology, history, art, and religious studies, subjects that are important for many museums. This seminar focuses on the meaning and function of portraiture as an emergent genre of representation during the fifteenth and sixteenth centuries in Italy, a perfect topic for someone designing a career in art museums. This course studies the relationships between trees and the environment, the interrelationships of organisms that compose the forest community, forest growth and development patterns, and field and laboratory techniques used in forest science and management. Anyone creation dioramas in natural history museum would profit greatly from taking such a course. This course is described as the study of the physical properties of magmas, eruptive mechanisms, volcanic products and the relationship between volcanism, tectonism, and human society. Such a course would be profitable for anyone working in a science museum who is interested in the impact that physical environmental forces have on human civilization. This is a studio course that concentrates in scenic design for the theatre. Students execute scenic designs for five plays in the course focusing on analysis, graphic representations, portfolio building, and exploring advanced techniques for making three-dimensional models. All of these skills fit very well with anyone interested in exhibit design in a museum context.